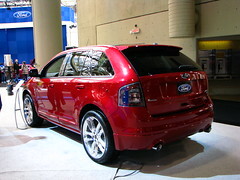 After a mid-cycle revamp for 2011, the 2012 Ford Edge receives mild changes but there is one big change for 2012. The 2012 Edge offers Ford’s new 2.0-liter EcoBoost engine as a $995 option across all trim lines. The engine outputs 240 horsepower and 275-pound feet of torque in the Edge. The 2012 Edge EcoBoost is the most fuel-efficient non-hybrid SUV in Ford’s history. It is rated at 21-mpg city and 30-mpg highway. This is more fuel-efficient than the compact 2012 Ford Escape SUV. The Edge EcoBoost will be offered with front-wheel drive only. The EcoBoost engine is a modified version of the 2.0-liter 160 horsepower engine found in the 2012 Ford Focus. It offers direct injection, balance shaft, and twin independent variable camshaft timing. This new engine makes the Edge EcoBoost one of the most fuel-efficient midsize SUV. It gets 2-mpg highway better than the new 2012 Explorer EcoBoost with the same engine. According to a review in the August 2011 edition of Car and Driver, the 2012 Edge EcoBoost has smooth, linear power delivery with virtually no turbo lag and a relatively quiet interior. They estimated the model would have a 0-60 time of about 7.4 seconds. The 2012 Ford Edges comes in four trims: SE, SEL, Limited, and Sport. The SE, SEL, and Limited offer a standard 3.5-liter 285 horsepower V6 engine. It is rated at 19-mpg city and 27-mpg highway with front-wheel drive. Highway mileage has improved by 1-mpg from last year as the 2012 model has low-rolling resistance tires and improved aerodynamic aimed to maximize fuel economy. The AWD trims have fuel economy of 18-mpg city and 25-mpg highway. All Edges come standard with a six-speed automatic transmission. The 2012 Edge Sport comes with a 3.7-liter 305 horsepower V6 engine that produces 285 pound-feet of torque. It has ten more pound-feet of torque than the Edge EcoBoost. The Edge Sport also has standard 22-inch polish aluminum wheels, smoke headlight treatment, smoked taillights, a black grille, body-dolor side lower cladding and rocker molding, leather seats, 6-way heated power fold flat front passenger seat, and oval chrome exhaust tips. The 2012 Ford Edge pricing is largely unchanged from 2011. The Edge SE has a starting MSRP of $27,640, which is the same as 2011. On the other end of the spectrum, the 2012 Edge Sport has a starting MSRP of $36,975. The midsize five-seat Edge slots between the Escape and seven-passenger Explorer in Ford’s crossover lineup. 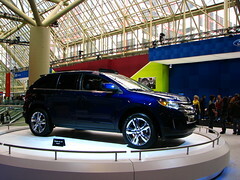 The Edge has a host of excellent standard safety features and was on the IIHS’ list of 2011 safest SUVs. The Edge’s competitors include the Nissan Murano, Toyota Venza, and Hyundai Santa Fe. If you like the Edge, vote for it in the poll at the bottom of our 2012 Toyota Venza post.